The Enviroblue Slimline Combi Internal Oil Boiler is a condensing floor standing boiler designed and manufactured by Firebird. It comes with a variety of features and benefits including an efficiency rating of 93% that makes this internal Combi oil boiler highly reliable and efficient. 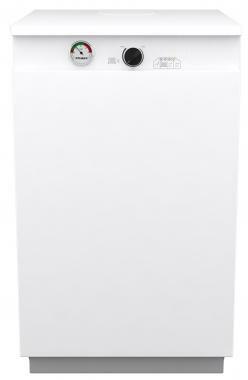 With it being Combi boiler it’s great for homes where space is limited as it doesn't require an external water tank or cylinder because everything is wrapped up in one cost-effective unit. As well as this, it comes with an output rating of 26kW making it perfect for smaller homes with not such a high demand for heating or hot water as well as only one bedroomed homes. Designed to fit under standard kitchen worktops, this boiler is compact in size which means that you can tuck it away and keep it out of sight. You’ll also be saving on installation costs. This unit also comes with outputs ranging from 20-35kW so it’s able to fit almost any type home with ease. This boiler has an excellent hot water performance and can produce over 16 litres per minute, so you'll never run out of hot water. It comes with a hard wearing casing that comes with a premium quality finish, a patented heat exchanger design, optional condensate pump and timer controller, fully insulation, a multi directional flue option, high performance Riello RDB blue flame technology and acoustically designed to be ultra quiet while in operation. With this boiler also featuring 2 years warranty you can be sure you're getting a highly dependable unit that isn't going to let you down.